Fall is in the air in my stitchy spot that is! Time to get those Autumnal pieces done if we want to display them in October and November. But before I share my stitching, I have to show you this wonderful LED lamp I found at Walmart for $10. At Grimmwood, my stitchy spot does not get a lot of natural light and my table lamp was not helping so I set out to look for a portable light weight lamp that I could use as I stitched. It is just perfect for my purposes. And it is very bright. I liked it so much, I purchased one for my NoAla home as well. My eyes are getting older and I am determined to keep stitching so this was a game changer for me. With my magnifier and my lamp I can cross stitch all evening without eye fatigue. I got one piece back from the framer. 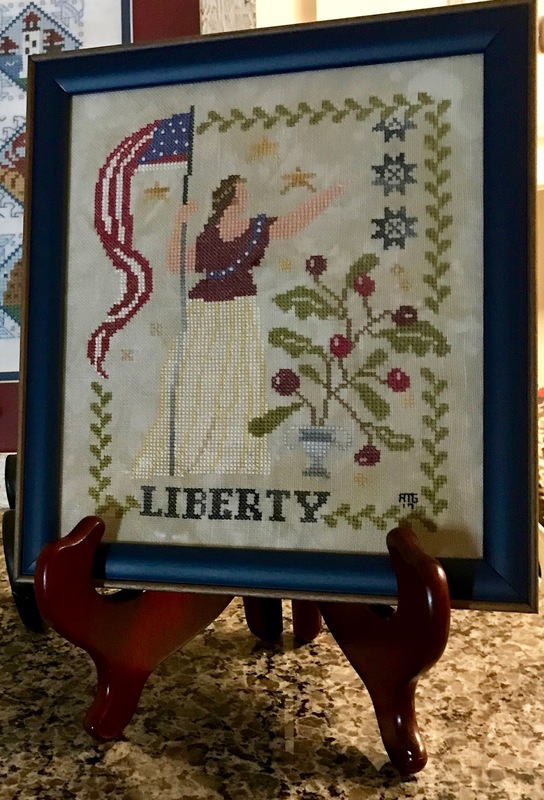 It is Lady Freedom by Brenda Gervais. I changed up the pattern a bit and I love it. I dropped off my Prairie Schooler village when I picked up this piece. I can hardly wait to get that one back. I am already thinking about where I will hang it! I started another piece for Grimmwood. It is Barnyard Christmas by Prairie Schooler. I am going to stitch all the animals on one piece of fabric. I started with the cow of course! And like my friend, Sandy at I Majored in Home Economics, I have started on some Smalls. Lizzie Kate designs some very cute small projects. And those are buttons on the owls eyes. Aren't they cute? I finished it pretty quickly. I am not sure how I will finish it but I will come up with something. I changed out some of the colors to be able to use my Colour and Cotton Threads. I am loving my subscription to their Floss of the Month Club. Happy Stitching all my Floss Loving Friends. Beautiful work! I love the autumn colors and patterns! Have a wonderful weekend. Very nice designs, Arlene! I love the small autumn piece and can't wait to see what finish you will come up with. Lady Freedom came out beautifully. What a great and useful lamp for only $10! I am going to have to look into getting one of those. I hope to have more time for stitching maybe once all the estate stuff is straightened out. But my aging eyes definitely need help! Your Liberty is beautiful and the frame sets it off wonderfully. The LK stitch is adorable, love the owls eyes, looking forward to seeing what you do with that. I'm working on the PS barnyard as ornaments for my nephew...they go slowly for me...I love that series. Enjoy the "autumn" feel in the air!! Ok, I love it all. That barnyard thing is going to be great. I can't wait to see that finished. I had looked at lamps...one that is very expensive, but could not pull the trigger on it. I think the one you got was genius. I didn't think of those being bright enough. I am going to get one of those for here and at the cabin too. I am in need of it at night for sure. I have been stitching on my second small. You truly inspire me! I'm taking my needle projects with me today when we leave for our beach trip! I'm saving the pattern you sent me to start on September first! It will be my newest tradition! Thanks so much for the sweet words....If you purchase the lamp, be sure it is the LED. Those lights are much brighter. I also like the fact that you can angle the light with this lamp. Sandy, I had looked at those pricy lamps as well. I started my October cottage yesterday using some overdyed floss. Linda, I hope you enjoy the pattern...I love little ones that I can finish easily. Mary, I would love to see your Barnyard animals. Another lady posted this project on line and she had done the small circles and put them on a straw wrath. It was very cute. Mrs T...this lamp was truly a game changer for me..one of the best purchases I have made in years. I say it is right up there with Q snaps. Beautiful stitching as always, you inspire me!! Love your new lamp...when our eyes start failing we just have to have more light!! Lovely work and they always look so nice framed when you finish. You are so talented and creative! I really like that lamp, and it's a bargain! I like the cow too and those button eyes are so cute! Arlene, those pieces are so cute and fun! I'm glad you found your lamp. It looks like you might be able to get a suntan with it as you stitch! Bright! I need one of those lamps! I'm going to put it on my list and hope they have one here! I need it for close projects. Love the Fall designs and lovely Fall colors! Enjoy your day! Hugs! What brand lamp did you get? It looks like it is very bright and would be helpful especially on dreary days or in darker rooms. Your Liberty piece looks fabulous in the frame molding you selected. Well done on your Autumn finish! Love seeing all your projects. What type of magnifying glass so you use? Sharon it is a magnifier that clips on my Q snaps. I got it at my local Needlework store. I do not remember the name but Amazon probably has something similar. UN91101 is the product name Sharon...it is approx $20 at Amazon. A belated Happy Birthday to your mother. 87 is a good age, my little mother is also 87, 88 later in the year. Love your stitching, I keep thinking I should get back into it but never get around to it. Thank you. I will be ordering one! The eyes are not what they used to be! Sharon it is very light weight and is perfect with q snaps. I always look forward to your Saturday Stitching posts!! Great new lamp and nice to know you didn't have to spend a ton on it. I find that I am needing more and more light to do just about anything any more. I usually end up removing my glasses to see up close--the first time in my life I've been happy to be really nearsighted :) I stitch by just holding the fabric very close to my face--weird, but it works for me!